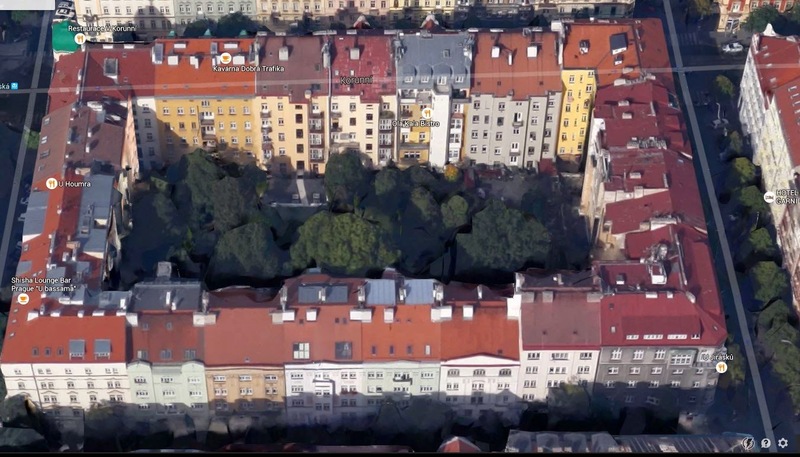 Even from the Google Maps view, you can see that there are some important differences between the first built form, which is in Royal Oak, Auckland, and the second, which in Prague. The second approach provides a lot more housing, but also a lot more shared green space in the centre of the block. The first approach chops up footpaths with vehicle accessways and creates few opportunities for socialising in public spaces. And while aesthetics are subjective, I think most people would generally agree that the second approach results in a more attractive city. So why do we get so much of the former and so little of the latter? The answer lies with a well-intentioned planning rule with some unintended consequences: setback rules. As shown in the following diagram, residential zoning rules typically require buildings to be constructed a certain minimum distance from the sides of the lot, with additional ‘recession planes’ to constrain the upper storeys. These are ubiquitous in contemporary residential zoning codes for a good reason: They prevent people from ‘building out’ their neighbours’ sunlight and privacy. From the perspective of managing externalities, or ‘spillovers’, in cities, setback rules are pretty reasonable. […] blocks such as this can be built progressively, they don’t need to spring up at once, building the blocs can be a matter of incremental development. But if that is true, then there must be transitional areas still around where we can see some buildings having been built up and some others haven’t. And indeed, looking at smaller cities, we can notice similarities between these blocs and blocs of smaller townhouses that are present in areas that were less central and less populated, and find areas where the two building forms coexist. What this means is that it is very possible for areas to have begun full of attached single-family houses with 2 stories (or maybe even one, but they’re rare nowadays), only to be progressively built up, either by being replaced or by having floors added to existing buildings. Of course, this process didn’t need to come up all at once, which means that for a while, there would have been “pop-out” buildings taller than the rest, with walls built ready to welcome buildings of its own size later one. So what is to be done? We can’t get rid of setback rules entirely, because they’re doing something useful, but keeping them in their current form isn’t a good idea either if we want a better city. New Zealand should adopt a system where neighbours can reciprocally agree to drop the shade plane and set back restrictions along their common border. This reciprocal intensification right could be implemented as a national policy statement under the RMA, which local authorities would then be obligated to implement. So in the above diagrams, if there was a section to the north or south and if the two property owners agree, then they would both have the right to build up to their adjoining boundary – utilising the appropriate building code for firewalls etc. If other adjoining neighbours disagreed, then on those boundaries the standard setback and shade plane rules would apply. Of course there would be many property owners who wouldn’t want their neighbour to build right up to their boundary. But some would see the advantage in co-operating, so they have the option of adding a granny flat or redeveloping their entire site. Making this reciprocal intensification right a choice eliminates the major criticism of up-zoning. Being, up-zoning dictates an exchange of a neighbour’s access to sun, views and privacy for the opportunity to intensify. Some property owners believe they will be worse off if this exchange is codified into the zoning map. If reciprocal intensification rights were spread across a large enough area, then this would give the opportunity for a lot of intensification – in the form of duplexes if two neighbours agree and European style terrace housing if many neighbours agree. Brendon’s proposal would effectively legalise the incremental development of perimeter block housing in New Zealand cities. While it wouldn’t guarantee that we’d get a better result, it would establish an option for waiving setback rules and building out to the site boundary. (c) the consent authority notifies the person proposing to undertake the activity that the activity is a permitted activity. For those of you (like me!) who find legal language difficult to interpret, the summary is: If your neighbour signs off on your plans to build out to the boundary, the council has to approve them, regardless of what it says in the planning rulebook. Of course, as written, this doesn’t exactly provide for reciprocal intensification – ie your neighbour has no guarantee that you will approve their plans at a later date. But according to a lawyer friend, that can be addressed by placing a covenant on the property title that requires the owner of each property to approve their neighbour’s plans. Overall, this a really useful law change that addresses one of the thorniest problems in urban planning. In an Act that is composed of a range of tweaks and fixes to a bewildering range of bureaucratic processes, this is a simple change that offers significant potential to make development easier and to get a better built form. It definitely deserves wider notice than it’s gotten to date. What do you think of the idea of legalising perimeter block housing in New Zealand? This is already allowed for in the unitary plan, more or less. 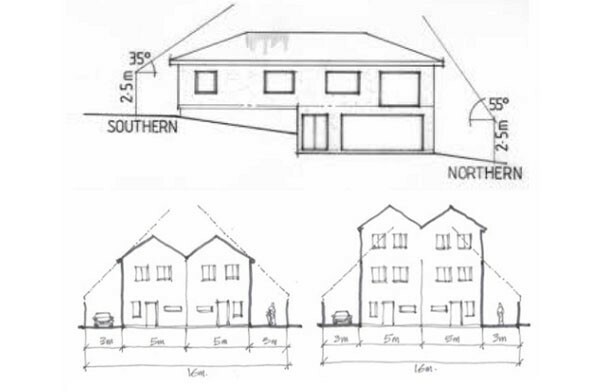 Height to boundary and side yards do not apply where a party wall exists or is proposed. So any two neighbors who arrange a party wall agreement can build to the boundary line. And any subdivision or multiple unit per site can just go ahead and do it. The current law requires a common wall, which is not always required and can be inflexible. Also sometimes some building are only joint by the roof of carport. So this is quite important to understand. As Guy M points out lower down in the post, a seismic gap is required if they are separated, hence 1 cm is kind of the worst of all worlds. No sharing of resources, no seismic gap. 1cm is an exaggeration to demonstrate my point. What my point is, if two neighbors on narrow sites don’t want a common wall, but want to waive their setback rules, it is not possible. Because the rules says building height in relate to boundary applies unless a common wall is built. Yes, I can see that. So this law change could be useful. I would imagine the change will take pressure off Council, too. the ACT candidate for Epsom has stated on Facebook last week that someone shouldn’t be able to build out someone else’s sunshine. When pointed out to him that that meant he must fundamentally agree with planning rules he disappeared from the conversation. ACT are all for removing rules on sprawl but against removing rules on intensification. In fact they want more rules on intensification to protect tax payer subsidised school zones. They may as well rename themselves the Epsom party. I think if you have a libertarian world-view then the death of Act couldn’t come to soon. I can’t tell what it stands for now. A new party that advocates consistently for less government might get a fair hearing. Yeah people want “less government” until there’s a crisis and then they can’t get enough of it. “Less government” = empty sound bite. Act party is really just the “rich peoples party”, then everything makes sense that they stand for. It’s neither libertarian or conservative which seems to confuse everyone as we try to put a political label on them. I think they were more libertarian in the Prebble days. They also used to get a lot more votes! A rort of the system to allow another electorate MP on the nat side of the house on top of their party vote percentage. Nothing else. Not just on the Nat side of the house, but further to the right, as the “reason” they have to adopt far-right policies. Exactly Heidi. Best thing they could do is get rid of all the electorates and just have a party vote without the 5% minimum. That way we would get proportionality without any games. What would you do about the likes of good ol’ Winnie who currently takes a few unknowns into parliament with him? And do you think 5% of the population is a bit large to be teetering on the edge of “will we be counted or won’t we”? I don’t have the answers but I suspect there’s no perfect system. What we most need is an independent state-sponsored media. Sorry – I actually misread your comment. I thought you wrote “with the 5% minimum”. I think I agree with you, despite the worry that there would be lots of little parties. We only have the 5% rule because Germany had it. They had the 5% rule because they were worried about Nazis getting in. I say dump the threshold and if someone can get 1% they get one of the seats, 2% 2 seats etc. If we have lots of parties well they have to either work together or they face another election. I think if you think it’s a risk to get one or two people from some “obscure party”, who cares, they are only a few? Better than what we have now. Yes. Unfortunately neither Labour nor National have wanted to lower the 5% so it would take a strong smaller coalition partner to force the change. I’m hoping this coming term might be a good chance. I have been living in Budapest for 2 years and I have really grown used to this style of development. Unfortunately our block is a lot denser than the one in the article so no nice trees in the middle for us (a couple of neighboring blocks do have these large central parks) Rather each building has it’s own courtyard and then in the middle there is a green space that the inner apartments of all the buildings look out on to, but I think this is accessible from only a handful of buildings. It is always great when you come across a 1 or 2 story building holding out in one of these blocks because it really shows how the city has grown up. What I like about this incremental development is that you don’t get lumped with a monotony of architecture and you don’t get the awkward dead space between buildings. In fact the lack of poorly lit spaces between buildings is one of the reasons Budapest feels so much safer to me than Auckland or Wellington. We were in the first for 10 months. Budapest is one of my favourite cities in Europe. I think the PT transport system there works really well. I think things like free PT for childs under 16 are good ideas – it’s fun seeing groups of 3-4 year olds on the bus going for a short trip. I’ve actually seen more of those inter-garden/courtyards areas in Vienna, but except in one case not on the scale shown in the picture. In Budapest we spent a lot of time in the various public playgrounds – there are a lot of them and they are usually busy. One of the ones we found the most fun as actually up in the Castle. Interestingly in Zagreb were I’ve also spent of time but in the newer developed areas the had more apartment blocks with attached green areas. Auckland already has this in the Viaduct. If one looks at Market Lane in the Viaduct area, there are a number of different apartment blocks around a central private garden. There are also a number of other apartment blocks in the area which are built as one development around common garden. That would be ‘The Parc’, which was built as a single development covering a whole block so no neighbours as such (i was a labourer on that job site during uni). Plus I think there has never been setback requirements in the city centre. Vinegar Lane in Ponsonby would probably be a better example. Individual sites being developed by different owners, albeit with a perimeter block design baked into the concept from the outset, rather than developing incrementally. Pet rules on body corporates are simply a BC rule, you can change that, it’s up to the owners to decide what they want. ALso I find the most rapid way to deal with noise is to go and talk to your neighbour and let them know they’re being noisy. Most of the time they are blissfully unaware. Also the worst noise problems I’ve had have been in the suburbs, people with their deck doors flung open drunkenly blasting music. Living in my apartment I never had much of an issue, well insulated with solid concrete walls and floors. We’re not at that point yet, the logical step up from what we have in most of Auckland are terraced houses. Terraced houses do not have body corporates. Perhaps banning pets is the BC response to all those complaints about noisy pets left in their apartments all day while their owners go to work? Has 87BA of the RLAA been used yet? If so I would be interested to know the outcome. As cities develop so does crime but crime expands faster. Never been a big issue in NZ for home owners but an issue we should be thinking about. The solution has been known for a millennia – perimeter housing – one solution to the concept of defensible space. There are 13th century examples in Italy still lived in – they have no doors on the outside and no first floor windows facing out either. The concept of defensible space is in our subconscious; you can see it when outsiders buy a typical old Auckland house and the first thing they do is put up a fence. It is very rare to see fences actually being taken down. Many of our retirement villages have a design with a single entrance to the properties so inhabitants can spot strangers easily. The most extreme example of defensible space is a Huli village with its deep outer trench and high picket fence with a single well guarded entrance. Doubt it will catch on in New Zealand because the men live separately in their own centrally placed house. Retro-fitting perimeter housing would be very difficult but developers should be given the chance to develop new estates. For example I live near a cul-de-sac of badly built 2-storey state housing with each house stand alone but it could be rebuilt similar to the examples in this article and house probably four times as many families while remaining only 2 storey. I doubt we have developers capable of producing the beauty of Prague. This can really only happen when land is developed or large blocks redeveloped (state housing, ex industrial land). The key is a large amount of shared common land in the centre sufficient for large trees, gardens, etc., not just a scrap of lawn with a swing & slide. The current planning rules already allow for it, so it is just down to developers and what they perceive as demand. I’d certainly be happy living in this kind of place. No, that is exactly the opposite of how this works. Euroblocs are built gradually. Eg take one of those blocks in any tramway-era suburb. Replace one of those old houses by 1, 2 or 3 terraced house. That’s the first step. Over a long time more houses on the block will be replaced by terraces and it will more and more look like that second image. So how do you end up with the large park in the middle if it is not planned from the start, when boundaries are established? You often don’t, in many places the space inside such blocks is divided into private yards, pretty much the same as what you see today. The basic layout — houses on the perimeter of the blocks, and open space in the middle — is already there. Interesting to look at that google maps view. A similar one of Pt Chev 20 years ago would have had similar green space between the houses. What a pity, eh? Perhaps the most important question to ask: In the areas not yet ruined by infill, will the UP encourage perimeter block housing OVER infill? I live middle left in this view and think this form of housing would be great to replace the ancient villas here. What your map doesn’t show well is the gentle slope towards the park that would make starting this form of housing on the southern side of the streets, especially when the park is across the road, relatively uncontroversial as you aren’t shading the sections to the north that much. Further to Nick R’s point above it’s much noisier here in the burbs than when I lived in the city in a pretty well sound proofed apartment- the rise of the outdoor speaker has made that so. Good question. Certainly there are precedents where neighbours have decided to pool their backyards to create a common park. I can’t imagine that happening to any large degree in New Zealand. We have more examples of ‘mews’ and perimeter terrace housing done by a single developer. But I do like the idea of a more organic development from single housing to this sort of building style… so yes, I think we need then to look at how to convert the backyards – with all their shading fences and uncoordinated planting patterns – into a cohesive space that conserves sunshine better. The only obvious idea I have would be to give owners the right to build in this style (if that is beyond the zone rules) only if they consent to conversion to common backyard space at some time in the future if there are sufficient adjacent properties to make it work. There are a few differences in the pattern of development between the Grey Lynn image and the pt chev image. 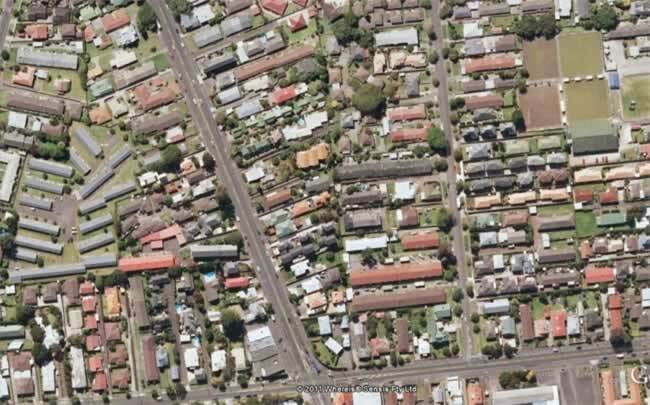 In the Grey Lynn image, the blocks were smaller, the original lots were smaller and narrower. It was therefore easy to do rear lot subdivisions in Pt Chev because the sections were wide enough to allow a driveway down the side of the section, and long enough that there was sufficient room to build one or more homes. I love the perimeter block idea, however many of our road layouts are not suited to this typology. Think 1960’s curving roads and cul-de-sacs. Yes, indeed it is the smaller sites that protected the possibility of the perimeter block housing in Grey Lynn. Scrolling around some of the dendritic street areas of Auckland, what strikes me is that there are some opportunities. More in the less developed areas, of course. Odd shaped blocks with curves, etc, isn’t a problem. It’s just needs the green space still available in the middle. But for the pattern to be realised in these spots, it would take quite a mindset change, and I think it would be unlikely to happen without Council tagging and directing the development. I’ve lived in both Grey Lynn and Onehunga. It’s interesting if you compare the houses built in the 1920s. They had about the same setback distance to the street, but the sections in Onehunga were much deeper – over double. So you got the in fill housing. In some respects the closer streets and higher land values would suit Terrace housing in places like Grey Lynn vs Onehunga. The strange part of height to boundary is it protects the sunlight on your back lawn. I like the idea of protecting sunlight to windows as that gives a warm dry home. But why do we protect sunlight to the entire site? I think you need an introduction to agriculture course. Are you suggesting it is so we can grow fodder in our back yards? You don’t? How do you feed your stock? Herbs, salad greens, fruit, flowers, a few medicinal plants – these are all easy peasy even for people who enjoy not gardening. But perhaps even more important is simply: plants. For filtering air, reducing the urban heat effect, calming nerves, enabling the soil to accept stormwater, producing oxygen. They generally need sun. And yes, I agree, sunshine to the windows is important. Second and fourth lecture here  next week seem useful to this topic. Wish I could go to all of those. I think when you get to multi-story residential complex, light is about clever layout. Homes do not have to be boring rectangles. They also do not have to be simple 2D layouts. L, C, S or other shapes can be used to control light into buildings. Not every room needs to be sunny, plus managing internal warmth is better done with insulation. Yes, and of course multi-home developments can insulate each other. My wife could tell you how much fun the central heating was in Zagreb. City-wide central heating. Great fun if there was a warm spell and the boilers were still running. Jokes aside. I think being able to build with modern passive building standards and spread the costs over multi-units/sites would be I think a good direction. I always thought it was strange that most sort after houses in Grey Lynn and Ponsonby are effectively impossible to build now due to the setback rules. So if this amendment achieves its goal of greater flexibility in the setback rules then I am in favour. Definitely have to sought out those Grey Lynn houses! Not only are they impossible to build today, but the Council has also made them exceedingly difficult to alter. My Mount Eden cottage is built right on the boundary with 9 feet between each of its neighbours. Unlike those neighbours who have already extended rearwards, I cannot do so now as I can’t build on the boundary any more. Not only that, if I even touch that boundary wall, I have to fire rate it AND the roof – which my architect say is effectively a total rebuild. I’d demolish it and build a replica to modern standards – but then I couldn’t build on the boundary etc etc. – an overall height limit in residential areas to stop shadows hitting buildings on the other side of the road. This will typically be about 20 metres high for a 20 metre wide road reserve, allowing 4 to 5 story high buildings. – a difference limit between adjacent buildings to prevent one dominating the visual form of the other. Say a maximum 50% difference. So if you have a 3 story building, your neighbour can build 2 to 4 stories, but not 1 or 5. This also reduces overshadowing of rooftop gardens etc. Sienna in Italy had rules for this for post war reconstruction. They worked very well to preserve the medieval character and amenity while still allowing development. Scott – 20m high for 20 m wide assumes that the sun shines uniformly at 45 degrees to the horizon – which it clearly doesn’t. Depending where you are in NZ and depending what time of day and especially what time of year – even at mid-day, where I live, sunlight access angles range between 70 degrees in mid-summer (great!) to 20 degrees in mid-winter. It’s interesting that you bring up Sienna – effectively no sunlight into most of the houses down most of the narrow streets – which would be awful in Auckland, abysmal in Dunedin – but quite nice in Sienna where they were actively trying to avoid the hot mid-day sun. Narrow streets there are good. Total street width of 4-5m wide is common – along with buildings at least 4-5 stories tall. Let’s see: Auckland is at approx. 37°S, Dunedin at 46°S. Prague is at approx. 50°N so the sun angles there would be slightly lower than in Dunedin. Prague definitely wouldn’t comply to any of these guidelines about shading planes. And yet, I’ve never seen anyone describe Prague as abysmal because of not enough sun on the streets. Agree. Also these angles only apply when the angle of the sun is perpendicular to the street, this only happens for a short time each day if at all. Interesting commentary on sun angles and boundaries. Having lived and holidayed in Australia and Europe, both areas are often dryer than New Zealand, even though they may be colder in winter. Making terrace housing work, let alone the perimeter housing in the Prague example really does require a pretty careful understanding of the land and the sun. New housing, for example at the end of some of the tramlines in Koln, is semi-detached 4-5 story blocks. They are clumped around common spaces that face toward the sun at different times of year and at different times of day. In the fancier developments, as well as the obligatory children’s play area, there are also common plots for vegetable gardens etc. Further in toward the city along those tram lines, are the more traditional styled 5 to 6 story buildings. I agree with you, Scott. It’s about balance. We can increase our city’s stock of homes within a 4 (or 5) storey limit, providing a more cohesive, walkable, yet still sunny and green city. Going higher than this brings in several negative aspects that we might as well avoid. Why build higher and create more shade? The street trees and plants in the raingardens won’t thrive, there will be more shading of windows, etc. Why design out the possibility for top floor residents to be able to make out faces and to be able to hear what’s going on in the street? This is important psychologically. Why design in the need for elevators when we’re looking at an uncertain energy future? Something i find quite ironic is that the THAB zone (which is sort of meant to encourage density), has a 3m at 45 degree HRB rule? Obviously doesn’t apply with common walls and a few other exceptions, but still – seems strange that the maximum height is 16m, but such a restrictive HRB rule. You just apply to use the alternative height in relation to boundary which is 8 m + 60 degrees (+ 2 m horizontal setback if more than 20 m from a legal road). With any luck that will become the permitted standard (as recommended by the IHP) when the appeals are resolved. Ah, that’s good to know. The THAB zone rules just seemed like they could not create THAB at all. THAB appears to be designed for stand alone mid rise apartment buildings on large sites, despite the name. Ironically terraced housing looks to be easier to deliver in Mixed Housing Urban. In that instance I was discussing mainly the abolition of side yards, but the next step – logical really – is the conglomeration of rear yards. Britain has that also in some of the developments – such as the mansion blocks in Kensington which had communal gardens at their centre, instead of multiple measly individual plots as is more typical. Of course, the thing about the Kensington -style blocks is that they were built as one, by rich developers such as the Duke of Bedford etc. Very hard to do that as a group of individual separate section owners, much easier to do that as a developer before the individual units get onsold. To really take advantage of the law, the calculation of building coverage should also change. Ideally building coverage should exempt the 2 metres space between the buildings boundaries as bonus building space to make it economically worthwhile. Otherwise, no land saving is achieved and there is no incentive to do so. Also, building does not needs to be joint by common wall, they can have a one centremetre gap to make them a ‘standalone’ houses. sort of wasted space having a 1cm gap though? Building code would require fire rating the walls anyways, so may as well join them and save money on materials + labour building two walls? Standalone house worth more in buyers mind, so it can be attractive to do so. I can’t see anyone ever building a perimeter block unless there was a strong rule requiring it. In NZ if you were allowed the perimeter part then they would build that then fill the centre in with more buildings done on the cheap. I don’t think it is simply a matter of getting rid of height to boundary, it would need a rule to protect the park bit in the centre. But it strikes me that these buildings are more about privatising open space than they are about improving yield. They are like some sort of gated park for a gated community. Do we really want that? Looks more like a shared backyard. We already have plenty of green space that is even more exclusive access than this. There are still rules on rear yards, outlooks space and building coverage, that in effect require you to not build off the back of buildings. To build on the park bit in the centre they would infringe on all three of rear yards, outlook space and building coverage. Current planning philosophy is that if I build a house, I need to protect daylight access into my neighbours side windows. What if planning philosophy was changed so that if I wanted to build a house with windows down the side of a building, I would need to provide an adequate side yard within my own property. This shift, combined with changes to vacant lot subdivision rules may allow for greater density over time. Precisely. If you want to protect daylight access to a particular part of your building, then design your building on your site to achieve that. Don’t expect to build all what you want and control your neighbours right to build instead. Yes, and it works if buildings aren’t too high. Thank you Peter for doing this follow-up article on reciprocal intensification. It would be good if New Zealand city councils, especially Auckland and Wellington, which have geographic constraints on outward organic growth, promoted this option as one measure to allow their cities to grow upwards organically. Making it easier for our cities to grow organically was my motivation when I originally came up with the idea of reciprocal intensification. I think it is exciting times for New Zealand cities. A real conversation is being had on the nature of cities in New Zealand. Perhaps for the first time ever, certainly in my lifetime, issues of housing, transport and urbanisation in general are rising to the top of the public debate.